My favorite quote in the entire piece is from the future Hall of Famer Bruce Bochy- “Personally, I feel if you hit a ball 400 feet, it should be a home run.” I have heard the EXACT same sentence on the Fitz and Brooks show for years. I know this, because I have said it 3,244 times! Hitting a baseball is the most difficult athletic skill required in professional sports. Nowhere else if you fail seven out of 10 times do you enter the Hall of Fame. The ball is round, the bat is round and yet you are supposed to hit it “square”. In 2017 batters face starting pitchers and then a parade of fireballing, fresh relievers. Defensive positioning is aided by computer “spray charts” of every at bat a player has taken and the likelihood of where a batted ball may land. Bottom line, being a quality hitter in today’s baseball is one very tough job. And there is no tougher place to go to work than Oracle Park in San Francisco. Based on all of the sport’s metrics it is the most difficult place to hit in all of baseball. Toss in wind and the evening marine layer and you start to get an idea that the players that spend half their career hitting at Oracle face a very difficult challenge. And being a power hitter? Please. Brandon Belt LED the Giants with 17 HRs last year. As a team they are usually at the bottom in round trippers. This is not news. Of course, Oracle is a spectacular ballpark, now almost 20 years old. It has character, charm, beauty and a lot of fantastic baseball memories. And one patently unfair area that is long overdue for change. “Triples Alley” might as well be called “where 390-foot rockets that are home runs everywhere else in the world are fly ball outs.” Yes, not nearly as catchy. Given all the difficulty of hitting a baseball, the bottom line is if you hit one over 390 feet it should be a home run. Just recently in Atlanta, Austin Slater hit an opposite field 363-foot fly ball that became a 3-run homer. At Oracle? Routine fly ball out. For Posey, Belt, Crawford, Panik, Pence and many others, Triples Alley is not a lot of fun. For the development of future power hitters it should be eliminated. To attract future power hitting free agents the ballpark needs to be an attraction, not radioactive. Make no mistake, the home run is here to stay. Baseball is currently experiencing its highest strike out rate, its highest walk rate and its highest home run rate. That IS the game today. And yet the Giants are woefully behind the revolution. Last or near last in all the offensive categories. Torture? Try watching this offense from the second half of last season through the first half of this season. Even in the World Series years this team had very little power. Except that so many great recent Giant memories are home runs. Posey against the Reds, Renteria against the Rangers, Ross against the Phillies, Ishikawa against the Cardinals, Pablo against the Tigers. Home runs are fun. Unless you are a Giant. Also, not scoring is boring. You crush a ball over 390 feet, it’s time to jog around the bases. Not left turn back to the dugout. Chicks dig the long ball, not the fly out. The photo above shows the adjustment needed to Oracle. Right field is awesome, distinctive. Keep the archways. 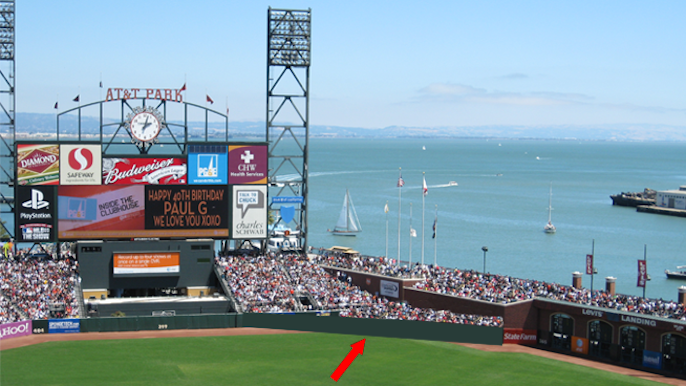 But where the wall currently juts out, put a normal height fence straight across with a similar angle to left center. 380 feet is not 421, a vast improvement. And no more 24-foot high wall. Make right center fair and equitable. Here’s some at-bats from Monday night’s win over the Rockies that, although they scored runs, could’ve become homers and scored even more runs with an adjustment to the fence. First, a sacrifice fly from Buster Posey. And here’s a triple off the wall from Belt that should’ve been long gone. Plus, a change in dimensions would create really excellent outfield seats. I’m sure the Giants can build a really cool club underneath as well. Fans win, players win, future players win, free agents win. Right now the Giants don’t win. And the vast wasteland in right center field doesn’t help. And it really never has.